Preheat oven to 350. Use regular cupcake tins and line with cupcake papers. Start with the graham cracker crumble. Pulse 10-12 crackers in a food processor until crumbley. Make sure you have 1 1/2 cups. Add the sugar. Melt the vegan butter, then add to crumbs and stir with a spoon. Mix well until combined. Press about 1 tablespoons of graham cracker crumb mixture into the bottom of the cupcake tins. Next, prep your chocolate cupcake mix. In a medium mixing bowl, whisk together your dry ingredients--beginning with flour, ending with salt. In a smaller bowl, whisk together your wet ingredients. Add the almond milk and apple cider vinegar in a medium bowl and let it sit for 3-5 minutes until it curdles like buttermilk. Add the rest of the wet, ending with almond extract. Now add the wet ingredients to the dry and stirring with a spoon, fold and mix together until the batter is fairly smooth--a few dry spots will be okay--you don't want to over mix--thus the spoon technique. Use a 1/4 measuring cup for smaller--either way, fill the cupcake holders to 1/2 full. Bake for about 20 minutes. Insert toothpick after 20 minutes to see if a toothpick inserted in cupcake comes out clean or when pressed with your finger, the dough springs back. Remove from oven and allow cupcakes to cool completely for about 45 minutes. Next, prep your frosting. Add vegan butter and about 1 cup of powdered sugar to a large bowl and mix well, then add teaspoon of vanilla extract and rest of powdered sugar--beating until the frosting is nice and creamy, but getting stiff--add more sugar and the almond milk if needed to get to desired frosting consistency. Fill a piping bag with frosting with desired piping tip for decorating. Next, melt all ingredients for chocolate sauce or ganache in the microwave for about 30 seconds (depending upon your microwave). Let sit for 5 minutes. Have extra graham crackers ready and cut in 1 inch squares for decorating. 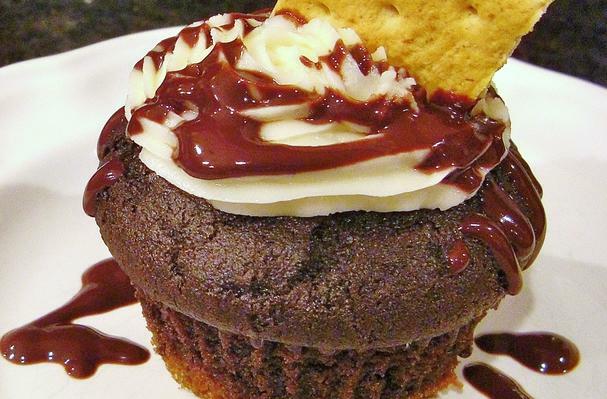 Once cupcakes have completely cooled, begin the process of final frosting, topping with chocolate drizzle and ending with the graham cracker as decoration. Sprinkle crumbs over frosting. Enjoy! Remember cupcakes TASTE BETTER the DAY AFTER! :) The flavors are even and blended after an extra day. I quickly referred to a saved recipe I saw at Kelly's website Vegan Thyme. She shared a beautiful creation that she veganized from Joy of Cooking that was originally called Black Bottom Cupcakes.